Last night I took part in the very excellent #UKMGchat on Twitter. For those of you not well-versed in the Twitness of the Universe, this is a hour every month when authors and others - bloggers, teachers, librarians, readers - take part in a scheduled chat about middle-grade books and reading. It usually has a theme, and last night's was myths and legends, curated by Sarwat Chadda, who knows a thing or two about inserting ancient gods into modern life. 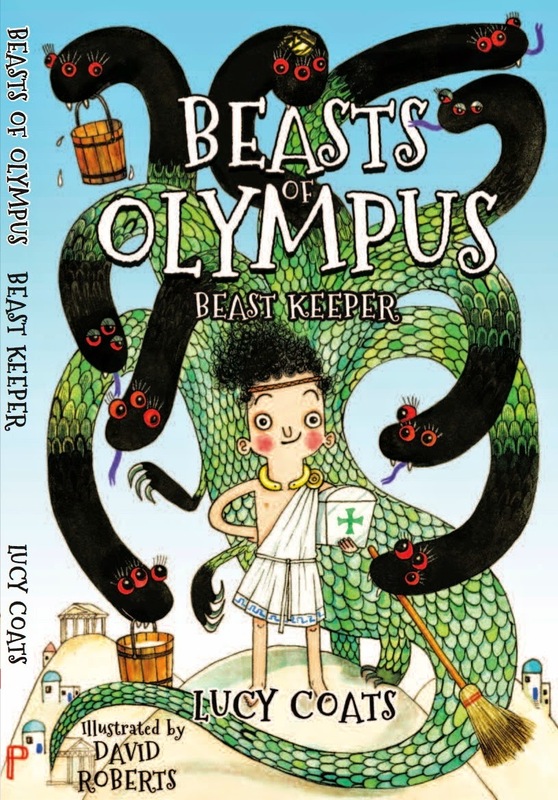 It was fast, furious, wide-ranging, and asked such questions as where myths end and fairytales begin as well as discussing people's favourite MG books, why Zeus had such loose morals (and why Hera put up with him). It also made me think about the MG series I've just written - Beasts of Olympus, (illustrated by the incredible David Roberts) - and try to define just why I enjoyed writing it so much. Essentially, the premise is simple. A boy called Pandemonius (Demon for short) is plucked from his life on earth, taken up to Olympus, and given the job of stable boy to the immortal beasts who live there. Of course, it's not as easy as that. Poor Demon has to contend with vicious claws, stings and beaks - and angry goddesses who don't like their nighties smelling of poo, among other things. He also has to contend with the bloodstained results of a certain 'hero's' animal-slaying antics - and this is where the fun came in for me. When I teach my Guardian writing course - and when I do events in schools - I tell my students that there is one question above all they must ask: WHAT IF? So I asked myself what if that well-known hero, Heracles, was actually a complete rotter? What if he was actually the baddie in the story? What if all those animals he killed down on earth were actually immortal? Who would treat their wounds and patch them up? What kind of person would he or she need to be? What qualities might they have? For me, asking those questions, deconstructing and refashioning the way I'd thought about certain mythical characters, was a refreshing change which made the whole myth canon come alive for me again. I've worked with these myths for so long - retelling them in various forms - that I almost couldn't see them any more. Taking them as the basis for something completely fictional of my own creating was a (literally) novel experience, and one I've enjoyed immensely. The Greek gods and goddesses have always been the most human of deities - they quarrel, are jealous, love, and have emotions just like us. But for me they were locked into their own myths. I knew them, but I didn't 'know' them. Now I do. I've had to delve deep into their characters, had to dig out their quirks and foibles, and visualise them from the point of view of a scared eleven-year-old boy who is terrified he'll be turned into a smoking pile of ash at any moment. I've also had to think about the beasts who are the whole raison d' être of the series. I suppose this is my nod to the animal rights movement - I've given the Hydra (also known as Doris), Kevin the flying horse, and Arnie the Griffin a voice so that they can make their feelings known. And boy, do they have feelings and opinions! Sometimes I have so much beastly clamour in my head that it's hard to disentangle it! I hope Zeus and Hera and the rest of the Olympians will forgive me for revealing all their secrets - if not, and you hear of a lightning bolt striking a house in Northamptonshire out of a clear blue winter sky, you'll know what happened to me. Meanwhile, a very happy Christmas from me when it comes, and look out for some beastly and Demonic doings in the New Year! Lovely post! I must seek out your book and read it... I had the same experience writing a series set in King Arthur's time - I felt I really got to know 'my' Arthur and Merlin and Gawaine and Lancelot in a completely new way, and it was great fun! It sounds fantastic fun, and a fantastic book, Lucy. Definitely going on someone's Christmas list!